As you [may] know, the purpose of the Social Flooring Index Blog is to monitor the social state of the flooring industry. What's fascinating is experiencing firsthand how different segments within the flooring industry have embraced social media, Twitter and the resulting relationship building. Based on Coverings 2012, the Tile Industry remains at the forefront. I say remains because my first flooring taste of this kind of socially generated connecting and networking took place during another Coverings in 2010 [for details, read Meetups and Tweetups: Building Community] when a Tweetup took place. Fast forward to 2012 and the setting is greatly enhanced [see Online Marketing Tips from Coverings Central 2012], but the interactions are just as intensely social and educational, and the new relationships are just as intense. For example, check out Todd Vendituoli's writeup on the Avente TileTalk Blog about tile industry trends from Coverings in Tile from Around the World - Coverings 2012. In the photo above, Bill Buyok, Paul Anater and I reconnected during the 2012 Coverings Tweetup. Photo courtesy of our bartender who was thrilled to pieces to have had his photo [see Bill's finger pointing to a specific tweet on the large screen] shared on Twitter. Hats off to my friends Buck and Dana Collins who participated in the Coverings 2012 Installation Showcase and who documented in marvelous detail their intense tile installation of Grant Gribble's design for this bathroom. Day 4 of the Coverings 2012 Installation Design showcase is complete! TalkContract [thanks, Emily!] shares these wonderful images in Coverings 2012. 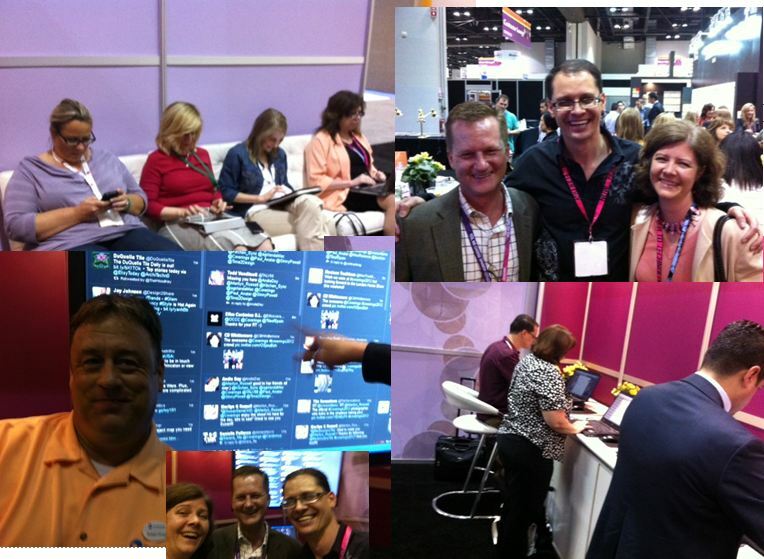 If you truly want to experience tile industry trends shared during Coverings 2012, check out the Transcript from #KBTribeChat from Coverings 2012 - you can see us hard at work sharing tile trend insights in the images above. If you were at Coverings, what did you see that intrigued you? Did you take part in the social interaction? Which were your favorite moments?